Renting in Portland – Why are the rents so damn high? One of the big problems people are complaining about right now are the cost of renting in the Portland Oregon Area. Portland has been on a huge number of “best of lists,” the climate is mild year round, and let’s face it, the nature nearby is awesome. Economically Portland is also growing as major tech companies move operations from the Bay Area, or local startups start hitting the big time. All of this is leading to historically low vacancy rates in Portland’s rental market! The last time we saw vacancy rates this low, was soon after the second wagon train on the Oregon trail reached it’s destination. 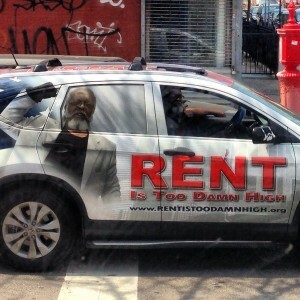 Why are the rents so damn high? So lets examine this in detail by “purchasing” a new property and working out the numbers. Currently, 4149 NE 82ND AVE is on the market for $1,095,000. It has 13 units, 12 of which are 2 bed, 1 bath. The last unit is 1 bed, 1 bath and is probably the property manager’s unit. For sake of argument, lets assume we are renting this one out too. Since this is commercial real estate you have to have 20% down to purchase. That is $219k, leaving us to finance $860089. Commercial real estate comes in at about a point higher then residential so let us assume at today’s rates an optimistically low 5.25% interest for a 30 year loan. The reality is that it may be higher and for a shorter loan time. That comes out to monthly payments of $5873.49. But we don’t have insurance or taxes in that. I’m going to ball park about $12000/year in insurance because it is a nice round number, but it is probably on the low side. The listing says that taxes are $14624.29 a year. So with these two costs the owner’s monthly debt is now $8292.18 a month. Divided by 13 units, rent is $637.86. Sounds great doesn’t it? Wait. I forgot management fees that typically run about 8% a month per a unit, assuming we don’t have onsite management who lives in that small unit for free. So we are now at $688.88/month. But that totally ignores other factors. A rule of thumb is to have 4 months operating costs on hand. That is $33168.72 total, and lets generously say we’ll save that over a year. That is an additional $212.62/month bringing our rent to $901.51 a month. Now, we still have another factor, the original $219k down. Since this is an investment property we need to recoup this cost. Typically we want these to be paid in 5-8 years, but lets assume ten years. That comes out to $140.38 per an apartment per a month. So our monthly is now $1041.89 per an apartment. Another cost we haven’t thought about is maintenance. It costs about $500 to rehab an apartment for the next tenant. New paint, patch holes in wall, cleaning, etc. We also have about $200 in legal and advertising fees to rent an apartment out. That is comes to another $58.33 a month bringing us to $1100.22 a month assuming we are doing 12 month leases. I happen to know that this property has been on the market for some time though, so I can safely surmise that in this market it must have a large number of problems that will add at least another 20% to the purchase cost. Otherwise it would have been purchased months ago.These are typically roof and foundation issues. A roof on a building that size is going to cost about $30k. Foundation issues can be $20k to $100k depending on the issues. We probably also need major renovations in each unit which typically come in at about $8k per a unit. Those include new carpet, appliances, and basic kitchen/bathroom remodeling. I would not be surprised to find it also needs major electrical and plumbing. Lets just say renovations to this property is going to cost $200k total which needs to come out of pocket up front or be financed. That brings our original price back up to the $1million dollar range and is going to add another $93 month per a unit over 30 years. So our total is now $1193/month, per a unit just to break even on all the costs. Don’t forget that we are putting $33168.72 per year into our emergency fund. Lets assume we only spend about half of it for emergency, basic maintenance and to cover months without tenants. We could probably drop rents $106.31 per a unit after the second year to account for this. Either way, under this scenario we are not making money until year 11 of ownership. Now, that all being said there are landlords who are skimping on maintenance and gouging on fees and rent. We could also probably talk the price down $100k or so but that is only going to change the monthly cost per a unit by $50 or so. Interestingly, Zillow.com estimates the rent on this property to be $1191 per a month so I’m pretty much in the ballpark.